When you’re making art, the quality of your supplies matters. Great markers will make the experience smoother for you and lead to a better finished product. Let us help you select the right markers for the task. Adult coloring is an activity that has been around for some time but is now growing in popularity with the mainstream. It provides stress relief, entertainment, and is just plain fun. The act of coloring has a profound brain-quieting, calming impact on professionals who otherwise might have a hard time relaxing. Can you remember the last instance where you were completely immersed in something other than work or your smart phone? Coloring can remind you of childhood, bringing out your imagination and reconnecting you with something purer. Mandalas are particularly calming designs due to their symmetry and beauty. 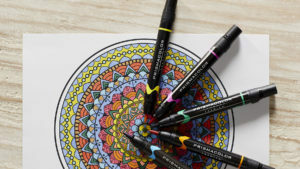 The ideal markers for coloring mandalas will be comfortable to hold for long periods of getting lost in your projects, will offer bleed-free, non-toxic ink, and will create lasting, vibrant color. You should also try to get pens that won’t dry out, especially if you are going to be sharing them with your kids. Let’s look at some of the best art tools for adult coloring.